Why do I have Moss on my roof? Here is a common issue most home buyer will not be aware of until they see the damage coming trough the drywall below. The real issue here is that the wall cladding is too close to the shingles and is absorbing the miosture from the roof. The best practice is to either step flash or fully flash the wall and roof and leave about 1-2″ of space between the shingles and the wall. 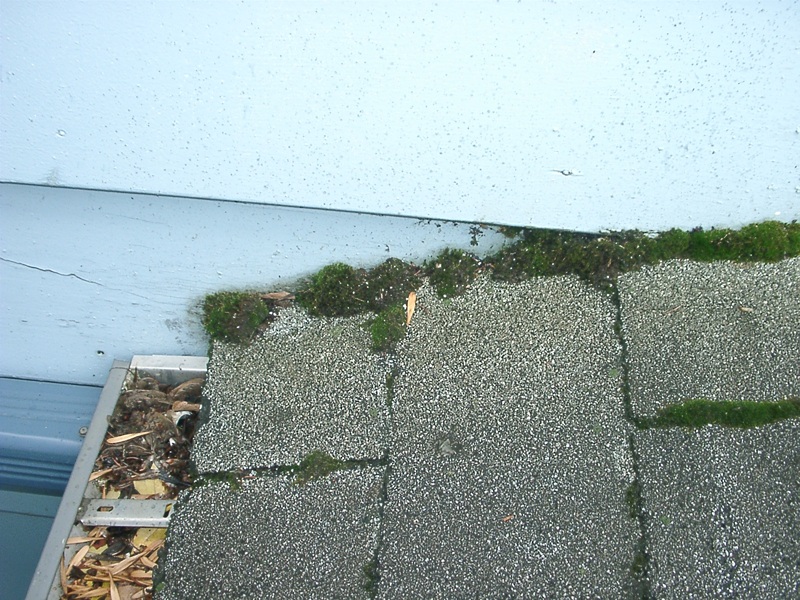 There is potential here for the moss which is moisture to rot the wall out and even cause structural failure. Notice also the evestrough is full. A dirty evestrough can also be a problem area for rot as water rots away the facia and ends of the rafter tails.